A tattler’s tales—some censored—from the hidden files of The Agency. Being in the CIA is different from being in just about any other walk of life, writes former case officer Mahle: “We tell ‘cover stories,’ not lies. We motivate agents to ‘collect intelligence on their behalf’; we do not manipulate, trick, or coerce. We ‘assess and exploit target candidate’s vulnerabilities’; we do not prey upon the weaknesses and entrap people by virtue of these weaknesses. We ‘collect intelligence’; we do not steal information.” And so on. 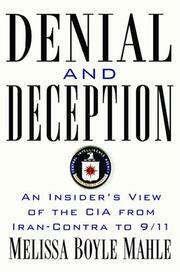 For all the self-deception and self-congratulation, Mahle suggests, the CIA is now deeply compromised, having been overseen by a succession of directors who prized technology over human intelligence and steadily eliminated agents who, by virtue of speaking various languages and maintaining various networks, could actually turn up useful information. Not that human agents were infallible; as Mahle writes, “in an amazing act of stupidity and bravado,” the senior agent in charge of tracking Somalian strongman Mohammed Farah Aideed blew his brains out in a game of Russian roulette, and Aideed went on to Black Hawk Down infamy. A worse blow, by Mahle’s account, came when the paramilitary power of the CIA was all but destroyed following the Iran-Contra affair of the 1980s. “Not only did the CIA no longer have a real capability to wage a secret war,” she writes, “it no longer thought in those terms.” Which, of course, has made the Agency all but useless in the days following 9/11. There are a few gaps in Mahle’s argument—the CIA “requested” that several passages be removed, including at least one that “discussed a lack of accountability for Iraq operations”—and the book is indifferently written. Readers will want to be watchful, too, for sour grapes, inasmuch as Mahle was herself fired for “an operational mistake” that remains classified. Still, a valuable critique of an intelligence unit that is clearly in need of reform—and, one gathers, of more money, power, and people.